Our belief is to Rescue, Stabilize and Transform the poor and more-than-poor of northern Sonora who are not being served by any agency or group. 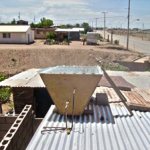 We are located in Agua Prieta, Sonora, Mexico, a very poor border town of 200,000 across from Douglas, Arizona. Since 2000, the Wings of Angels Crisis Intervention Clinic in Agua Prieta has held 115 consecutive monthly clinics (10,000 patient visits) staffed by volunteers, medical doctors and nurses who provide medical and dental treatment, administer care and deliver medications, arrange surgeries, provide glasses, prosthetics and orthotics, provide family counseling and mentoring, formulated milk, diapers, physical therapy and equipment, wheelchairs, blankets, fresh produce from the Wings teaching garden, support for education, and winterized shelters. To understand the lifestyle of the poor and more-than-poor it is helpful to read the somewhat shocking descriptions below. 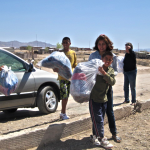 The mission of Wings of Angels Foundation is to rescue, stabilize and transform the more-than-poor border families, in Agua Prieta alone 40,000, and Northern Sonora, Mexico.